We stood in front of the imposing Malpaga Castle, a 14th century castle located a short drive from the city of Bergamo in the Lombardy region of northern Italy. Surrounded by a broad moat and characterised by impressive towers, the Malpaga Castle differs from its peers in the sense that it wasn’t built on a hilltop or steep rockface but rather in a broad plain with the Serio River running though it. In the 15th century, the (in)famous warlord Bartolomeo Colleoni occupied the castle and used it as a base from which to protect Venice from attacks by the Duchy of Milan. These days, the castle is famous not only for its formidable architecture but also its stunning frescoes which survived the centuries. 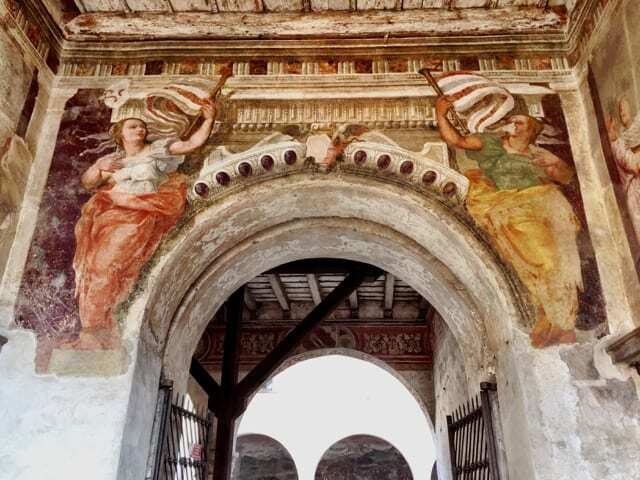 The stunning frescoes at the entrance of the Malpaga Castle. Chef Carlo demonstrating how to make pumpkin ravioli. I was really looking forward to visiting this castle because we were going to follow a cooking course in the castle’s kitchen. I love cooking courses, especially those which involve making pasta! Me and my travel mates were ushered into the kitchen where we were introduced to Chef Carlo and his team. He explained the menu for the day: steak tartare, pumpkin ravioli and tiramisu. We quickly put on our aprons and got to work, starting with the tiramisu. Within minutes, we were whisking castor sugar, egg yolk and mixing this with mascarpone and cream. After placing the fluffy result in a bowl atop a biscuit drenched in coffee, we moved on to the next course: pumpkin ravioli. I love making pasta! There’s just something therapeutic and soothing about mixing the flour and eggs, kneading the dough and creating pasta in any form you like! I felt very much in my element and poured as much love as I could into the pasta. Making a meal in the kitchen of a medieval castle added a unique dimension to the cooking course and I enjoyed it tremendously! Our finished ravioli! Not bad, huh? The final course: steak tartare, was the easiest. Steak tartare is best when the meat used is top-notch and sliced correctly. We chopped up the meat into fine bits before adding some olive oil, herbs and lemon juice. We then stuffed the meat into a mold and placed it on a plate with some salad leaves. Done! We were then led into the stunning banquet hall, decorated with 16th century frescoes by Fogolino. I gasped as we entered. The walls seemed to come to life and I couldn’t help but think what an incredible place this was to have a meal. The banquet hall in Malpaga Castle. The dining hall is full of beautiful frescoes. We sat down and simply looked around us in silent awe. Our meal was soon served; first our steak tartare, then the gorgeous pumpkin ravioli (that turned out superbly! ), followed by the dreamy tiramisu. Dining in this hall, eating food we prepared ourselves, was an incredible experience! We finished our meal with an espresso shot and were then led to another part of the castle where we found racks of fancy-looking costumes. “We’re dressing up in medieval costumes?”, I asked, with a slight hint of irritation I guess. “Yes!”, my guide exclaimed, with a look of mischief in her eyes. Anyone who knows me well knows that I have a disdain for dressing up in fancy clothes, yet lately, I keep getting myself into these situations during my travels. The last time was just a few months earlier during the Terra de Trobadors Festival in Catalonia. “Oh well, just go with it. It’ll be fun!”, I reassured myself. This is what bloggers do on a medieval costume tour! Haha! And fun it most certainly was! I picked an extravagant velvet robe (staying true to my blog of course!) with beautiful gold embroidery and matching head gear. When we were all dressed, we looked at each other and burst out laughing! We looked so regal! We had lots of fun posing! Our guide then led us on a tour through the castle as she explained the history of the castle and its colourful inhabitants. The fresco-filled rooms were a sight to behold! We couldn’t stop laughing though as we struck funny poses in our medieval costumes. Stunning frescoes in the central courtyard of the castle. My visit to the Malpaga Castle was unlike any of my previous visits to a medieval castle. The cooking course, having a meal in that grand banquet hall and touring the castle in medieval costumes sure added a unique, quirky touch; one which made the visit so much fun and memorable. Note: my visit to Bergamo is part of the #inLombardia365 project, a collaboration between iambassador and Lombardy Tourism. As always, all views expressed above are mine, and mine only. The castle is an amazing place! Plan a visit next time you’re in Milan – it’s not too far away.